The first 2 tips are to improve your guest’s experience. I think that the small details have the biggest impact on making everyone feel comfortable and relaxed – the key to a fun party! Taking the time to decide what to do with your friend’s coats in the Winter time will help make those first few seconds of greetings go even more smoothly. I am blessed with ample closet space in my new-ish apartment so I was able to clear out everything except for the winter coats I wear regularly (for my own convenience) to make room for all of the coats to come. I will admit, “Can I hang up your coat for you?” is one of my favorite questions. I’ve become this way because good closet space is so rare in Manhattan! 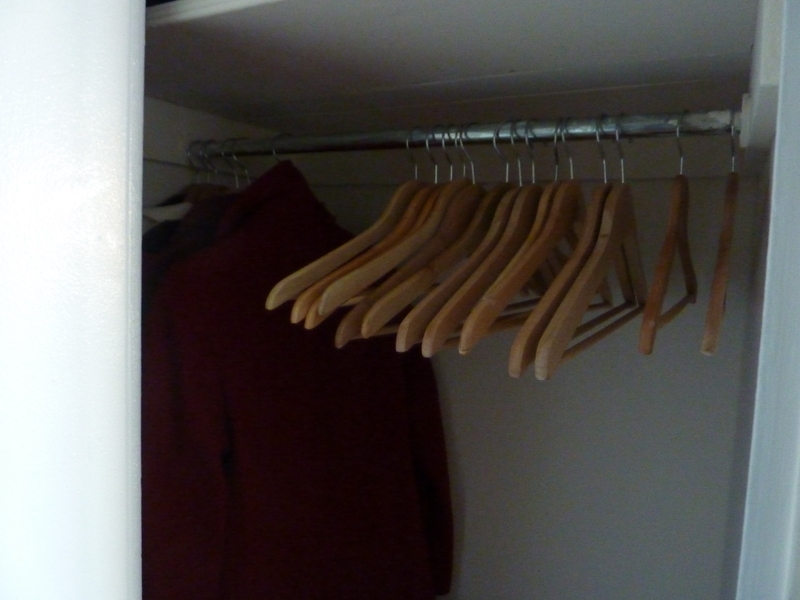 So, if you don’t have the closets, simply decide where the coats should go. Designate a “coat chair” or using your bed is also a perfectly respectable alternative. Just remember- if you are telling everyone to use your bed, you have to make sure your whole bedroom is cleaned up and welcoming also. At very least, make sure the lights are on! There is nothing more uncomfortable than being in a social eating situation and spilling on yourself, or missing your mouth, or God forbid – having to spit something out, and not having a napkin within reach. Especially if I’m serving any messy foods I always try to “over-napkin”. In the case of the Superbowl party I had 2 stacks of cocktail napkins on the coffee table as well as dinner napkins on the buffet table. An easy way to make sure you’re never in a bind is to keep cocktail napkins on hand. 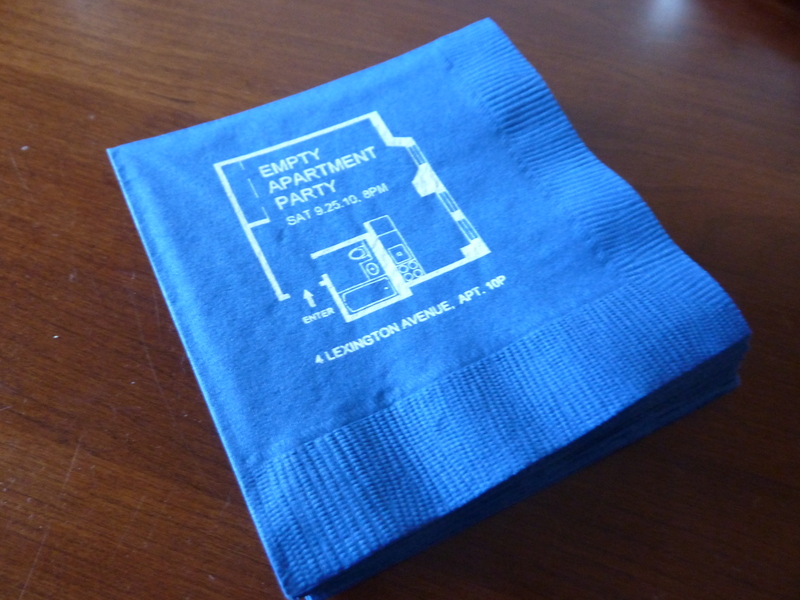 I had 200 of these custom printed for the “Empty Apartment” party I had after I moved last fall (they actually didn’t make it in time for the party). The image is from the invitation and is the actual floor plan! I loved the image and knew I would enjoy using them for a while, which is why I ordered such a large quantity (and it was obviously a better price per napkin). I chose this shade of blue (it is between navy and royal) because it is season-less. My party routine is that I make the food and my friends bring the booze. In the case of this party, I asked everyone to bring a 6-pack. So, knowing that everyone would be drinking from bottles, (normally I’m a believer of pouring beer into glasses but not during the Superbowl) I realized that I needed an easily accessible recycle bin – unlike my small one under the sink. Voila! Straight from Sunday morning’s Whole Foods trip*, the double paper bag worked perfectly! All the bottles piled up and at the end of the night all I had to do was take it to my floor’s recycle area, as is. I can not over exaggerate how convenient this was, especially for how little effort it took. Of everything that went into the party, I swear, this was the smartest thing I did! *I have to add here that 99.9% of the time I carry and use my own shopping bags – I am dedicated to doing my part in this way. My grocery bags are from Hannaford Market in Plymouth Mass and are unmatched in awesomeness. I also always keep a small bag in my purse for Duane Reed, etc. However, sometimes traditional bags have a useful purpose when you recycle them for new uses in your life. 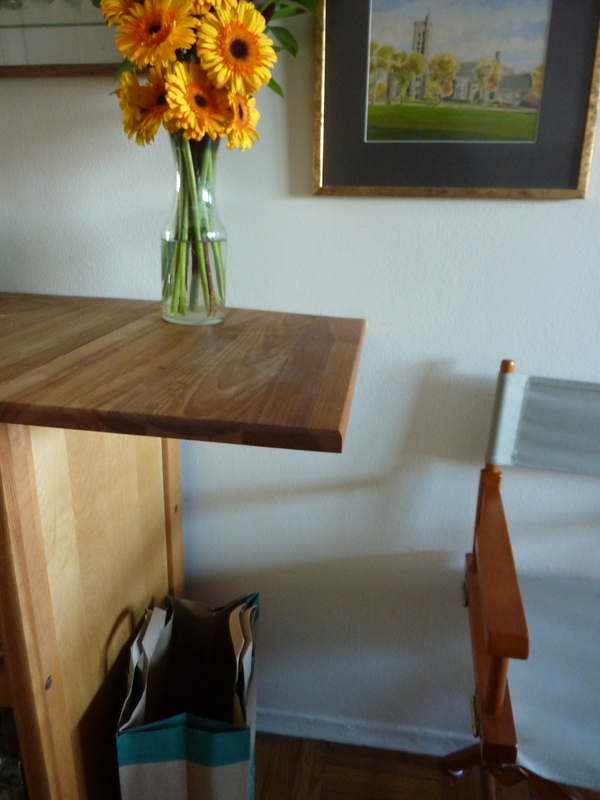 This entry was posted in Entertaining, Tips & Tricks and tagged Closet, Dinner Party, easy, Entertaining, napkins, Recycle, Tips. Bookmark the permalink.